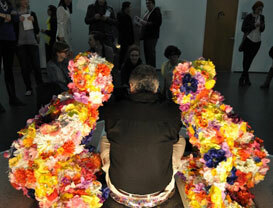 You probably know of Isa Genzken as the iconic German artist famous for her wild sculpture assemblages. And you may have heard that her MCA exhibition which opened mid-April had a lot to do with 9/11, but what’s suspiciously absent from the reviews of the show is that Genzken is a super freak. 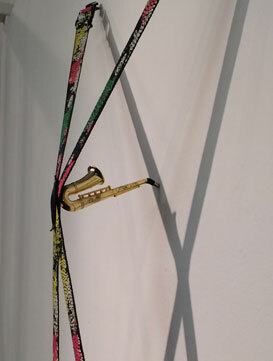 References to disco, colorful music and clubs are constant throughout the exhibition. 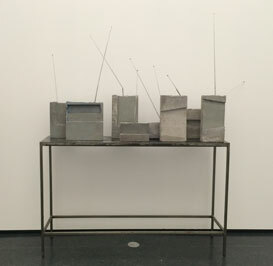 Genzken’s cement boom box table is solemn but still lyrical, and the 2002-2003 series “Social Facades” are like flattened disco balls. Mirrored plastic panels and bright club kid colors are incorporated in many of the sculptures and 2-D works on view at the museum. 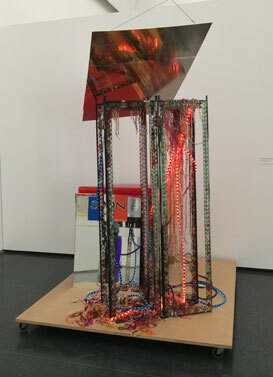 One of the most prominent sculptures included in the show looks like and is called “Disco Soon” from the “Ground Zero” series. A multicolored party light in a shopping bag stands out in a room of installation behind the disco sculpture. Aside from the disco vibes, the video work on display is pretty entertaining. One piece is a lo-fi amorphous melodrama featuring fellow German art superstar, Kai Althoff. At one point Genzken waxes poetic on the weather reporting in Europe and how much better it is in the US. She also made a tourist-y video of skyscrapers and facades in Chicago called “Drive Chicago” when she visited the city for a show at the Renaissance Society in 1992. It’s presented in a room that’s kind of too bright for video, but you can lounge in those comfy Pippiloti Rist bean bags while you watch. Disco ‘Soon’ (Ground Zero), 2008. In addition to video and disco, Isa is the OG queen of selfies (telling you, there’s a lot more than 9/11 and mannequins). Portraits comprise a subtle but sustained presence in her work. 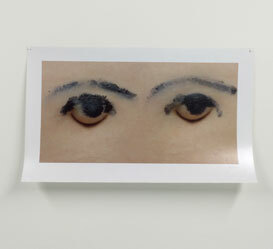 Genzken is seen at various points in her life: as a young artist in various statues of undress for a video performance, in still photographs amongst a collage of other artists, as an x-ray image drinking wine and then there’s the photo of her ear taken by Gerhard Richter. Disco might be silly, but it’s way less ridic than that other major solo retrospective in town. The exhibition is on view at the MCA until August 3rd. And you thought there were a lot of openings during the winter. 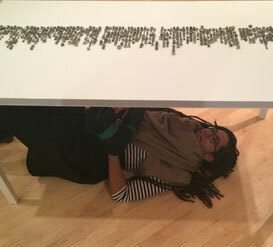 Caroline Carlsmith’s work at the Northwestern MFA exhibition at the Block made viewers get down. Literally. 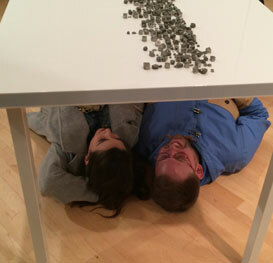 Emily Kay Henson and Robert Chase Heishman underneath Carlsmith’s table with precisely arranged pyrite. Diana Harper reading Carlsmith’s poem “The Procedure of Pyritization”. 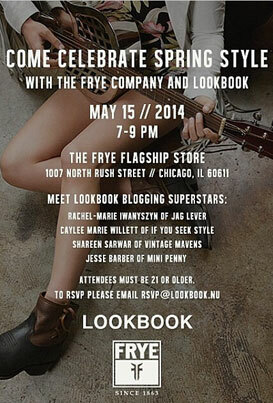 Way easier to fit entire Northwestern MFA class in a single photo. 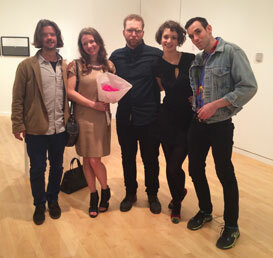 Raphaël Fleuriet, Caroline Carlsmith, TJ Proechel, Nicole Wilson and Jason Dixon. 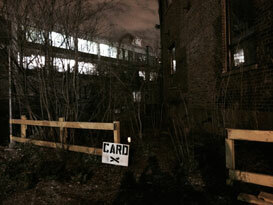 The spooky entrance to Cardinal Cross. If you missed the opening you can still visit the exhibition (if you dare!) 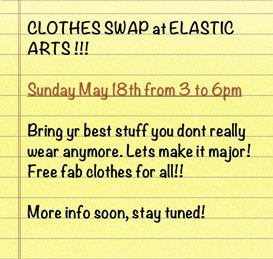 on May 17th from 3-10PM. 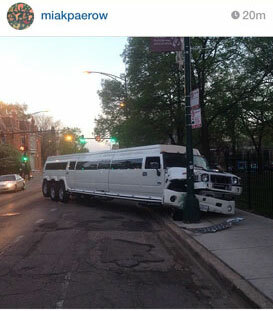 This is your brain on Tony Balko. Peep this video from last weekend’s Cardinal Cross. 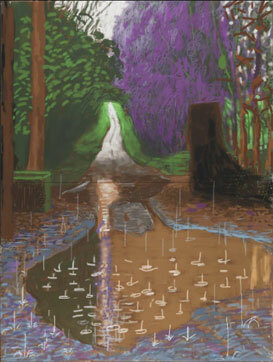 Work by Michael Kloss in If I had my life to live over, I’d live over a delicastessen on view at Johalla until June 15th. Thorne Brandt, Chris Cook, and Anna Cerniglia at the opening for “If I had my live to live over, I’d live over a delicatessen” (mouthful) at Johalla this past Friday night. Work by Ilie Paun Capriel on view at Johalla until June 15th. 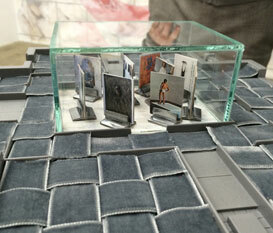 Header image features work by Caroline Carlsmith, on view at the Block Museum until June 22nd. 92 9/10 × 70 1/10 in. Edition of 10. Annely Juda Fine Art. 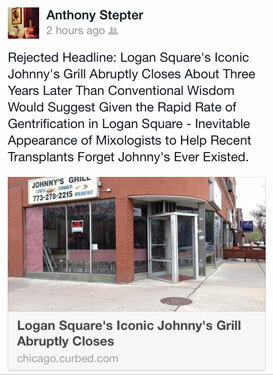 Stepter on the closing of Johnny’s Diner in Logan Sq. PS- did you hear that the #Logansquarist is “hiring”? 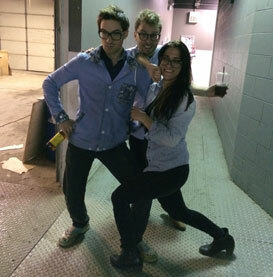 THIS happened Saturday night. You’re welcome. Photo by Mike Paro. 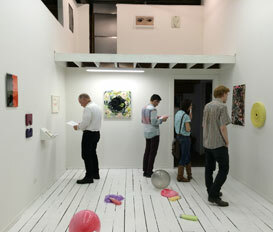 Work by Anaïs Daly (ceiling) and Ron Ewert on view at Johalla until June 15th. 18th street was packed on Friday night as art lovers (?) 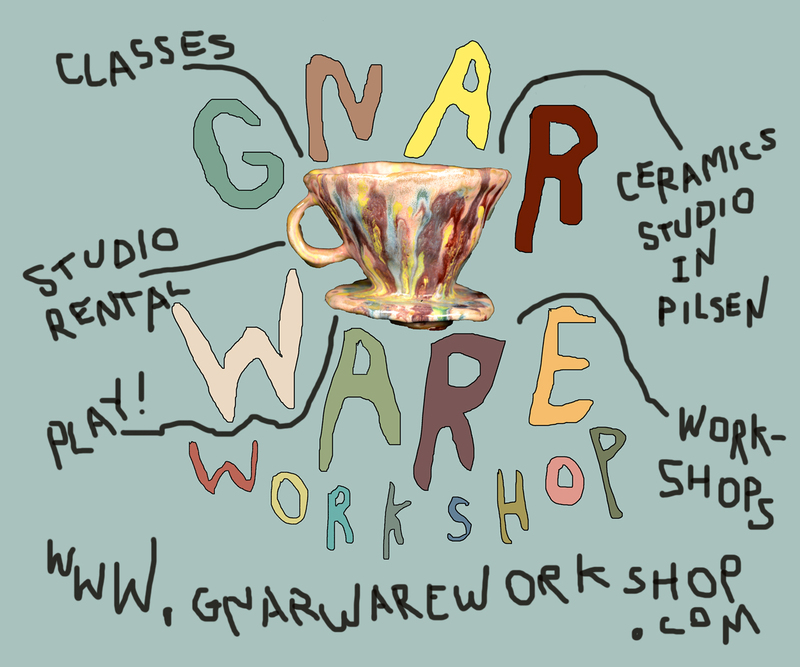 came out of the woodwork for Pilsen Art Walk. 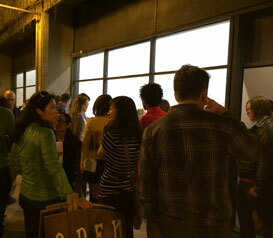 This is the scene outside of ROOMS gallery during a performance in the front window. Work by Jeremiah Jones on display at rooms. Watch the video (of the video), it’s really cool! 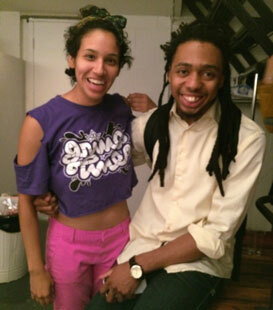 Christian Cruz with Elee Eck at the ROOMS gallery opening for Jones Friday night. The opening for Miss Kilman and She Were Terrible Together curated by none other than Matt Morris at The Hills Esthetic Center on Saturday night. 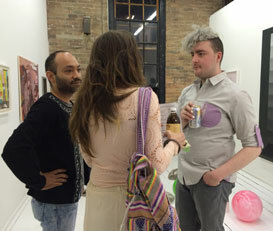 Morris with Ben Foch and Chelsea Culp at the opening for the exhibition, Miss Kilman and She Were Terrible Together at The Hills Esthetic Center on Saturday night. 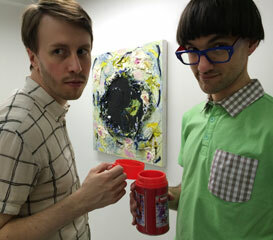 Giving good face: Andrew Holmquist with Eric Ruschman in front of a painting by Joan Snyder at The Hills. Can’t decide if I was more into this belly button eye print or the painting of Tupac. Like Chromatic Consortium, we loved this show for the effortless mixing of more recognizable names like Richard Hawkins, Miller/Shellabarger and Alex da Corte with students from Morris’s undergrad studio seminar. 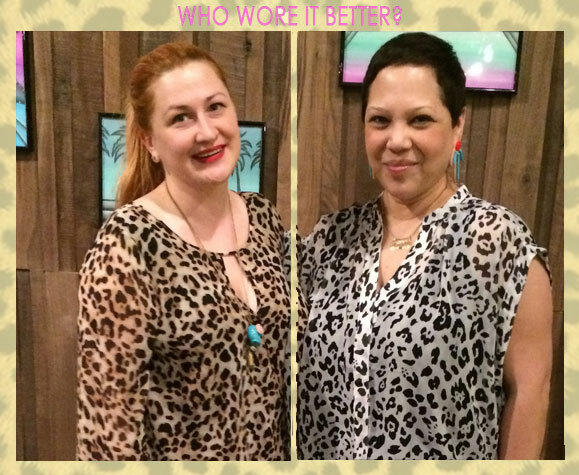 Ladies Who Wear Leopard: Curator Kristin Korolowicz VS. The Franklin’s Edra Soto at Dock 6 Design + Art #7 this past Friday. 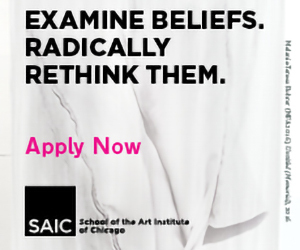 If you’ve been to the SAIC MFA show, you know the process and trappings of exhibition display are IN. Here are just a few recent encounters. 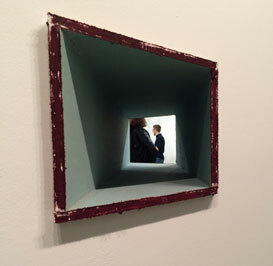 With back to back exhibitions at Peregrine Program and The Hills, Matt Morris is right on trend. 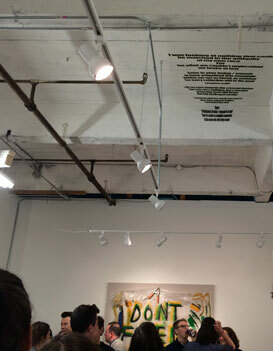 His exhibition i’m issue; i’m free is on view at Peregrine until May 25th. 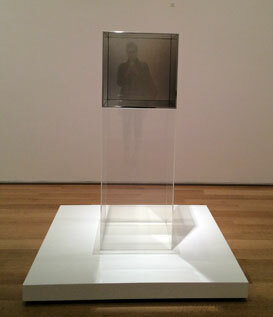 OG exhibition practice: work by Larry Bell on display at the Art Institute. Did you know Bell was born in Chicago? 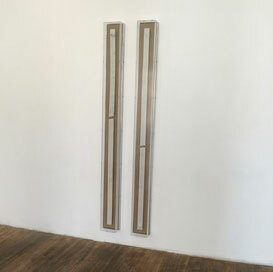 Arguably one of the contemporary kings of vitrine making, Dan Baird has impeccably executed work on display in There is a Screen with Ryan Lauderdale at LVL3 until June 15th. Mothergirl “What You Look Like, Now” performance at the MCA. Photo by Abraham Ritchie.